Every year, from late spring to early fall, trained staff and biologists seine the East River as part of the Conservancy’s Education Program. 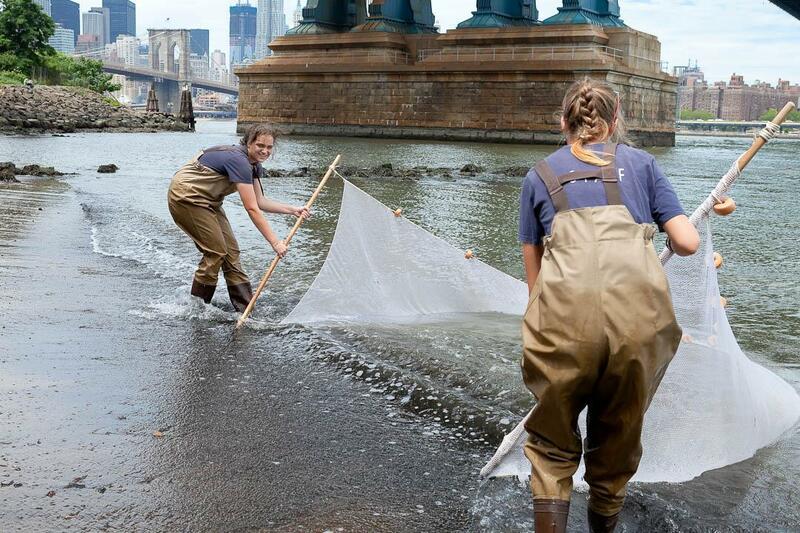 Beginning in 2008, seining at Brooklyn Bridge Park predates the opening of the park itself! Seining is a method of fishing that uses a large net to humanely catch and release estuary organisms, and in the process, educates thousands of Ed Center students and visitors in ecology conservation each year. In addition to public education, the seining program is an invaluable tool for data collection. Our 10 years of fish and water quality data has been useful for assessing the overall health of our waterways. Over time we have seen an increase in fish and diversity in our catches - great news for the health of the river. Throughout the year, hardy fish such as flounders, striped bass, and oyster toadfish typically occupy the East River Estuary. However, every August and September, tiny, brightly colored tropical fish have begun to find their way into the New York Harbor. These larval and newly born tropicals are carried by the Gulf Stream all the way up the eastern coastline. For the educators at Brooklyn Bridge Park Conservancy, it is truly an exciting catch of the day. 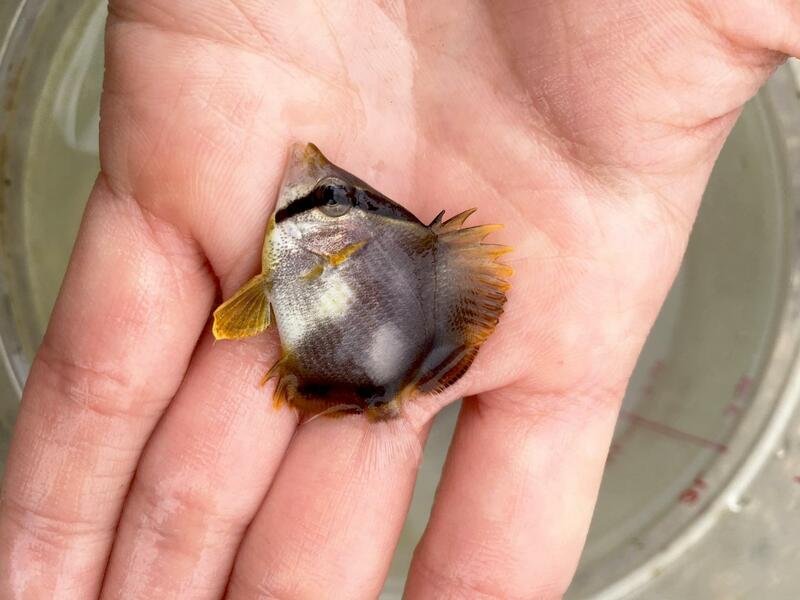 This season we caught unique tropicals including spotfin butterflyfish, stripped burrfish, and banded rudderfish. Sadly, as winter approaches, these young fish are unlikely to survive the cold temperatures of the northern waters. In fisherman terms, these tropicals are considered “strays” or “orphans”. Scientists have noticed an increasing number of these strays in recent years, with some scientists speculating climate change as the influence. Most of the fish and other marine invertebrates caught during our seining programs are released at the end of the program. We keep a few of the most exciting catches at the Environmental Education Center, rotating fish out as we catch new ones - think of it as a fish hotel. A visit to the Ed Center during Open Hours will give you a small glimpse of the rich aquatic life bordering Brooklyn. 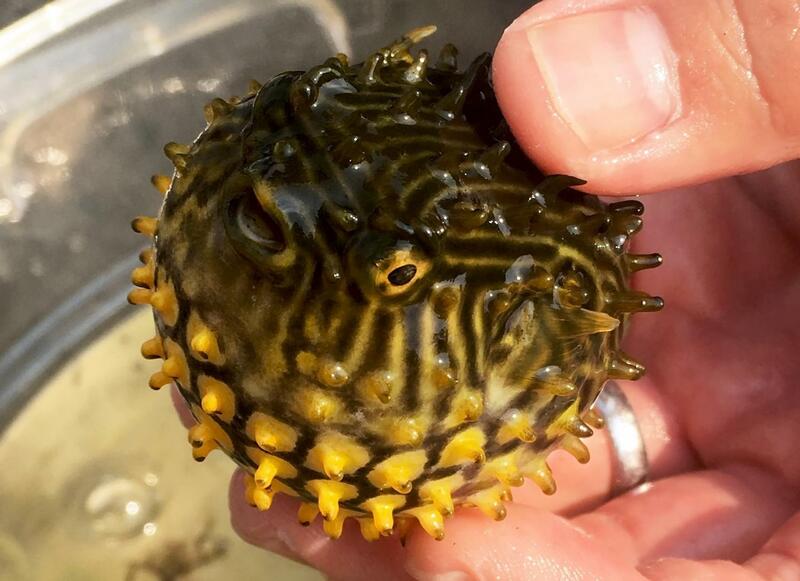 Stop by soon and you may even have an opportunity to see one of our recent tropical catches, like the burrfish in the photo above!